If you have an affiliation with a group or another person, you are officially involved or connected with them. If something is an anomaly, it is different from what is usual or expected and is hence highly noticeable. Contiguous things are in contact with or near each other; contiguous events happen one right after the other without a break. Things that are disparate are clearly different from each other and belong to very different groups or classes. A dissident is someone who disagrees publicly with a government, especially in a country where this is not allowed. A small group or issue which is factious is controversial and promotes strong disagreement or dissatisfaction within a larger group. Liaison is the cooperation and exchange of information between people or organizations so that they can work well together. A nexus is a connection or a series of connections between a number of people, things, or ideas, often forming the center of a system or situation. The propinquity of a thing is its nearness in location, relationship, or similarity. If two people have a good rapport, they have a good understanding of and can communicate well with each other. Rapprochement is the development of greater understanding and friendliness between two countries or groups of people after a period of unfriendly relations. A schism causes a group or organization to divide into two groups as a result of differences in its aims and beliefs. In his lecture on the causes of the Civil War, the professor connected or concatenated separate, isolated happenings together into a logical chain of events. Samuel had never thought about the events of his grandfather’s lifetime in this linked, concatenated way before. As he listened to the professor speak, Samuel finally understood how these separate events joined and concatenated into a chain of influences and reactions that produced the final conflict. Quiz: Try again! What does it mean to concatenate things? To organize them chronologically through time. To lay them out logically according to an ideal. To join them together, end to end, in a chain. If you concatenate two or more things, you join them together by linking them one after the other. Nate's Cat Cones Nate stuffed cats into large ice cream cones in order to concatenate them into cone cat chains. 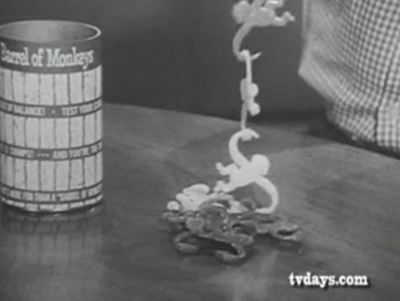 Advertisement: Barrel of Monkeys Concatenating toy monkeys.